On Dave's Picks Vol. 1‚ recorded on May 25‚ 1977 at The Mosque in Richmond‚ Virginia‚ the touch of the musicians is so delicate‚ the force of the playing is deceptive‚ as is grows almost imperceptibly to gale force by the time the two sets are over. 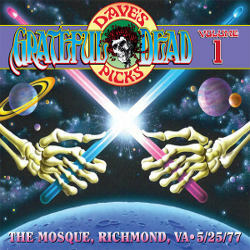 This is an auspicious but appropriate way to inaugurate the new Grateful Dead archive series. Beginning in the most unassuming and casual manner with "Mississippi Half Step Uptown Toodleloo‚" the band then moves slowly through material that allows them to imperceptibly prepare themselves -- and the audience -- for the high-powered exploration on disc three as constituted by "The Other One‚" interpolated with "Wharf Rat‚" and "The Wheel." All this happens before the band returns to the solid firmament constituted by two Chuck Berry covers‚ "Around and Around" and "Johnny B. Goode‚" those tracks a reminder that the Grateful Dead always were a dance band: sometimes for the spirit‚ sometimes for the body and‚ often times‚ for both simultaneously. The earlier portions of the two-set performance find the band carefully and consciously displaying their knowledge of their material. "They Love Each Other" displays the tiniest flourishes at the start and the group expands upon them at the conclusion. The coupling of "Lazy Lightning" and "Supplication" represents the line of demarcation between structured songs and vehicles for improvisation. And as the group begins its second second set‚ it channels the momentum accumulated to this point through progressively sharp rhythmic bounces of "Scarlet Begonias" and "Fire on the Mountain." The interlude of "Drums" proves how even a passage so truncated can become the flashpoint for the Grateful Dead to catch fire. With the concept of Dave's Picks hearkening back to the original archival concentration on complete concerts‚ scheduled for release on a quarterly basis‚ the foundation for the series is as sturdy as the structure given the packaging by the inlay of plastic disc trays (in contrast to the mere slip sleeves for the bare-bones Road Trips packaging). All of which design meets execution brilliantly here. It's a metaphor for the playing of the Grateful Dead during this performance‚ one of the highlights from the most arresting periods in the group's concert history.